My name is Ny. I am a former Buddhist student from Rajabo Buddhist High School. I have one brother and two sisters. All of my siblings are dropped out of school, for my family is not good condition, and also they do not want to progress their learning even though I encouraged them to school. As I was living in my hometown I didn’t know much how the world it is, when I was finished from Primary School my mother and my grandfather sent me to stay with monk in 2009. I had stayed in Samrong Pagoda in order to continue my education at Samrong High School in grade 7. 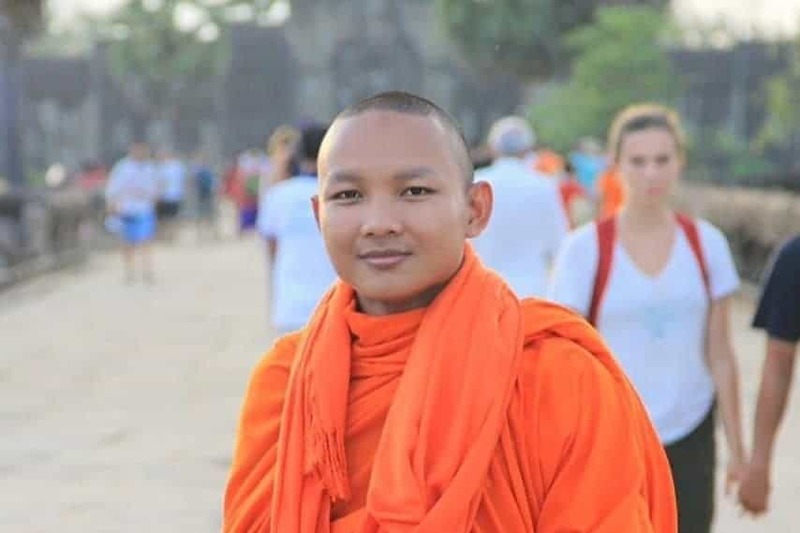 As a monastery’s boy for my daily life, I always served the monks in the early morning around 4:30 am from day to day, and I also helped pagoda’s work when I had free time from school. After I was living for a year, I myself asked my mother to be a monk, for I love about this religion, and I as well wanted to learn about it. I explained to my mother that I want to be a monk, yet in that time she was so excited when I said like that. Because she wanted me to be a monk for many times, but I always rejected, for I was afraid with the monks. But everything was very different when I had stayed in the temple I knew the way how to talk and the way how respect. So, she allowed me to be monk in 2010. Not only I have become as a monk, I also learned many things from Buddhist School. I was started learning in my previously pagoda called Samrong for a year, and then I moved to three other different pagodas such as Wat Monthyean, Wat Khemara, and the pagoda I am living now is Kessararam pagoda. For my firstly moving, I studied in Monthyean pagoda in 2012. Moreover, I had a lot of Buddhist monk friends, and they were so kind, friendly, and generous, I was excited. Everything is limited even my previous temple, so I need to move to access my education, so I had other residences to live until this present, I am continuing my learning as an academic student at the University. I know who I am, I have already set my target to be succeeded my future goal. A goal is an important thing that everyone must do it whenever we do not want to do anything you might be waste much the time to spend with unnecessary thing. Please be concentrated about our daily life. Learn what you want, for it is your inspiration with the things you wish.